?Split-Seconds - Five Minute Repeating? Tiffany & Co., made by Patek Philippe & Co., Genève, No. 112199. Made in 1901, sold on June 30, 1902. Very fine and rare, 18K gold and enamel, keyless five minute minute repeating pocket watch with split seconds chronograph. C. Four body, solid, "bassine ", polished, the back with a blue champlevé enamel monogram. Hinged gold cuvette engraved with a dedication dated 1910. D. White enamel with Breguet numerals, outer minutes and concentric fifths of a second tracks, red painted outer Arabic five minute numerals, subsidiary seconds. Blued steel "spade" hands. M. 18?? ?, nickel plated, ?fausses-côtes? decoration, 36 jewels, wolf?s tooth winding, counterpoised straight line lever escapement, cut bimetallic compensation balance, blued steel Breguet balance spring, index regulator, five minute repeating on gongs activated by a slide in the band. Chronograph with visible work, button on the winding crown and split second push piece in the band. Signed by Tiffany on the dial, case and movement. Diam. 52 mm. C. Four body, solid, "bassine ", polished, the back with a blue champlevé enamel monogram. Hinged gold cuvette engraved with a dedication dated 1910. D. White enamel with Breguet numerals, outer minutes and concentric fifths of a second tracks, red painted outer Arabic five minute numerals, subsidiary seconds. Blued steel "spade" hands. M. 18, nickel plated, fausses-côtes decoration, 36 jewels, wolfs tooth winding, counterpoised straight line lever escapement, cut bimetallic compensation balance, blued steel Breguet balance spring, index regulator, five minute repeating on gongs activated by a slide in the band. Chronograph with visible work, button on the winding crown and split second push piece in the band. Signed by Tiffany on the dial, case and movement. Diam. 52 mm. 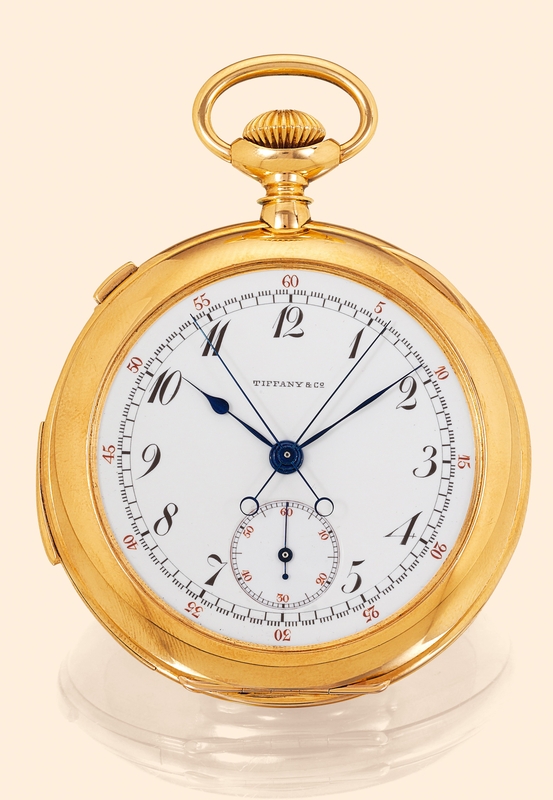 The movement of the present watch was made in 1901 and sold to Tiffany & Co. on June 30, 1902.